WSU Yakima County Master Gardeners learn and share our expertise with our community. Master Gardeners welcome YOU! In Yakima County in 2019 – 118 active and 24 emeritus Master Gardeners were able to pursue many activities to fulfill our mission of education our communities regarding WSU approved horticultural practices. Our clinic venues answered questions and helped solve gardening problems for home gardeners at our WSU Extension clinic, Farmer’s Market and Central WA State Fair. Our Demonstration garden at Ahtanum Youth Park and our Heirloom garden are both teaching gardens where classes are held during the spring, summer and fall. We also hold courses four Wednesdays evening in March for the public, our speakers bureau team spoke to several groups throughout the year and our writers guild research and submit gardening articles for both the Sunday Yakima Herald and monthly Yakima Magazine. Our Youth programs, both in schools and at community events, reached hundreds of youngsters with garden related learning activities. A recent addition, the Kamaikin Garden on the Yakama Reservation, joins our Community Garden in Buena to help this low-income area grow nutritious, health food. Our Greenhouse allows us to propagate plants from seed or cuttings to be sold at our annual plant sale to the public in order to raise income to support our Yakima MG program. 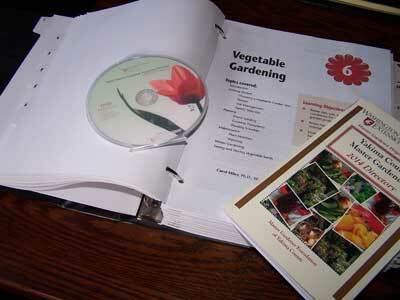 As a Master Gardener trainee, you begin in January attending 16 live 2 hour classes on Wednesday afternoons. In addition you enroll in an online course from WSU that covers horticulture basics. There is a fee to cover training materials and classes. It is necessary to have a computer and high speed internet connection. You are asked to return 50 hours of volunteer time within the year in specific areas. Upon successful completion you will be awarded a certificate with the title of Master Gardener. As a veteran, there are no additional fees and each year you are asked to give 25 hours of volunteer time and achieve at least 10 hours of continuing education in order to maintain your certification. If this interests you – please read our Information Sheet for details and print a copy of our downloadable application. For questions email Claudia at finevines@aol.com. Take the Challenge! Come join us!